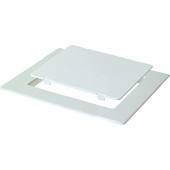 White Access Panel 6″x 9″ ABS Plastic. Need to get inside a wall? here is the answer. Easy installed panel gives you ready access to hard to get-to plumbing and electrical. Now you don’t have to take the wall down to change your bathroom faucets or make repairs. Just cut the right size hole in your Sheetrock or or paneling, use adhesive to mount door and do your repairs. When finish, just snap door back in installed framing. ABS Access Doors can be painted to match room’s decor. Access panels can be installed for easy future access for plumbing repairs. Available in two sizes to fit any job. Can be installed surface mounted or on rough framing.